With its beautiful grassy expanses and Renaissance basilica of Santa Maria Novella, Florence’s Piazza di Santa Maria Novella is beloved by Florentines and visitors alike. The centrally located square, lined with historic townhouses, restaurants, and cafés, has been a popular gathering place for 800 years. Piazza di Santa Maria Novella was built in the late 13th century and quickly became a center of Florentine life. Over the centuries, a number of festivals and tournaments were held here, and the two large obelisks sitting atop four bronze turtles by Giambologna that still decorate the square’s center were erected in the 1500s as marks for chariot races. 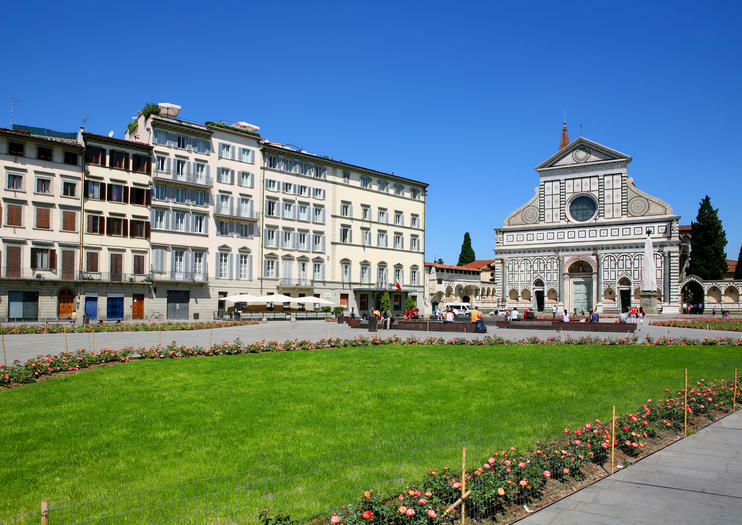 One of Florence’s most beautiful churches, Santa Maria Novella, dominates this busy square, which is also home to the former Hospital of San Paolo, famous for its loggia decorated with majolica reliefs by Andrea della Robbia. Many private or small-group Florence walking tours and tours by Segway or electric bike include a stop in Piazza di Santa Maria Novella along with visits to highlights like the Uffizi Gallery, Ponte Vecchio, the Accademia Gallery (Galleria dell'Accademia), Piazzale Michelangelo, the Florence Duomo, and Santa Croce (Basilica di Santa Croce). Another unique way to experience the piazza is by joining a street-food tour that stops at the cafés and gelato shops around the square. With its large open spaces, gelato shops, and public benches, Piazza di Santa Maria Novella is a convenient stop for kids. Santa Maria Novella also has a pretty cloister and historic pharmacy selling herbal teas, perfumes, and soaps just off the square. Most cultural and food tours of the historic center of Florence and Piazza di Santa Maria Novella are on foot, so choose comfortable shoes and bring a sun hat. This public square is pedestrian only and perfectly flat, so easy to access with a wheelchair or stroller. Piazza di Santa Maria Novella is in the historic center of Florence, just across the street from the city’s main train station that shares its name. The square is particularly lovely at night, when Florentines gather for an evening stroll with their gelato against the backdrop of the illuminated church facade. In addition to its magnificent 15th-century facade designed by Leon Battista Alberti, this Renaissance monument is home to artistic masterpieces by Masaccio, Filippino Lippi, Brunelleschi, and Giotto in addition to Domenico Ghirlandaio’s beautiful Tornabuoni Chapel. This daylong shore excursion from Livorno takes you through the Italian countryside to the towns of Pisa and Florence. Travel in a air-conditioned minivan with Wi-Fi to Pisa, where you can see and photograph the city’s famous Leaning Tower. Then it’s on to Florence where highlights include Piazzale Michelangelo, a square with panoramic views of Florence, and Piazza Santa Croce, where Galileo and Machiavelli are buried. Have lunch on your own before heading back to port. Enjoy a guided tour of Florence on two wheels with this bike tour. Explore the Tuscan capital by bike with a gelato stop included. Discover Renaissance legends and layers of romantic history on a 2-hour walking tour of Florence. Stroll through the medieval city center with a knowledgeable guide, who will point out hidden gems and share insights into the city’s artistic and architectural legacy. Stop for a traditional Italian aperitif at a café, and soak up the scenery of daily life passing through a local piazza. Walk through Florence’s most beautiful and delectable quarters on this 3-hour food and culture tour. Stroll past stacks of fresh produce and Italian gourmet products at the San Lorenzo market, stopping to sample local specialties like sweet almond cookies, Chianti wine, salami, and Pecorino cheese. Then head to some of the city’s most prized Renaissance treasures, including Piazza della Signoria and the Duomo, and finish with tastings of traditional Florentine peasant food. Treat your taste buds to some of Italy’s most prized culinary products with this gourmet tasting tour and dinner in Florence. Sample an array of Tuscan delicacies like truffle bruschetta, extra virgin olive oil and reserve Prosecco with a foodie guide, and then gather around a private chef’s table for a homecooked, 3-course dinner of regional specialties. Tour size is limited to eight for a more personalized, small-group experience. Our 3 hours Safari Tour of Florence for Kids is the best way to make your children enjoy while discovering interesting and engaging information about Florence's history and architecture.This is an interactive and engaging tour, but also a funny and educative one, in which your child-friendly guide will take you and your children to the most beautiful and famous attractions of Florence, such as Santa Maria Novella, Palazzo Strozzi, Piazza Della Repubblica, Pig Market, Old Bridge, Piazza Della Signoria, Piazza Degli Uffizi, and many others.With this tour, you will have the opportunity to enjoy looking for the animals on the most famous Florentine sites! Discover the top sights of Florence by bike on a 2.5-hour cycling tour of the UNESCO listed city center and more. Set at a leisurely pace, the tour is ideal for visitors of all ages. Enjoy frequent stops to take photos and learn about your surroundings. The well-rounded tour also includes a bottle of water to keep you hydrated and a complimentary gelato. Let’s face it: those selfies and quick snaps from your camera phone don’t always do your travels justice. Invest in the services of professional photographer while you visit Florence and document the trip properly. A local guide designs a customized route through the city based on your unique needs, then a library of professional photos is available for download within five business days of the shoot. Looking for an introduction to one of the world’s most beautiful cities? Then this is the tour for you! Get the lowdown on the fascinating history of Florence (think murder, family rivalries and the Black Death! ), find out why it’s known as the Cradle of Civilisation and explore some of its most beautiful and iconic architecture. Reward yourself for a morning well spent with a refreshing Italian aperitivo as we watch the world walk by. Perfezione!- Spend a memorable morning exploring the most iconic monuments in Florence- Gain insight into the rich history of this great renaissance city with an expert local guide by your side - Walk in the footsteps of world luminaries such as Julius Caesar, Leonardo di Vinci, Michelangelo and Donatello - Learn the secrets of the mysterious Medici family - Sit back and enjoy a glass of prosecco or an Aperol spritz as you process all you have learned! L'Officina Profumo-Farmaceutica di Santa Maria Novella è la farmacia più antica d'Europa, aperta al pubblico dal 1612, conosciuta anche in Cina, Russia ed altri paesi sin dal XVII secolo per l'unicità dei dei suoi prodotti.Entrati nell'Officina Profumo-Farmaceutica si ha la sensazione di entrare in un'altra epoca, inebriati dai profumi e meravigliati dalle lunghe file di essenze, saponi e profumi che sono una gioia per l'olfatto e per gli occhi.Inoltre, nella Tisaneria sarà possibile degustare le bevande (tè, tisane,cioccolate, cocktail) preparate secondo le antiche ricette. Take part in a family-friendly Florence "safari" on this half-day private tour. With a guide in the lead and kids participating, hunt down different coats of arms, statues, animals, and symbols that serve as introductions to Florentine culture. This treasure hunt comes complete with commentary focused on kids to get them learning and keep them interested. If you are a family with kids and you wish to take a fun tour of the city, this is the perfect tour for you! With our private licensed and child friendly guide, you will walk through the alleys and streets of Florence to discover the secrets and legends hidden behind statues and palaces. A walking tour of 3 hours that allow you and your kids to discover Florence with the eyes of a little kid. Explore Florence’s most stylish district on a private, 4-hour tour. Stroll through Santa Maria Novella square and down Via Tornabuoni, home to a plethora of luxury boutiques and high fashion houses. Learn about the area’s history and highlights from a savvy local guide, and catch a whiff of fine Italian perfume at Europe’s oldest pharmacy. After working up an appetite walking, settle into a reserved table at a typical Florentine restaurant to enjoy your choice of an aperitif or a light 2-course lunch. Step inside one of Florence’s spiritual gems with a guided tour of the Santa Maria de Novella church, a Gothic-Renaissance design that’s steeped in centuries of Florentine history. Admire evocative frescoes and devotional sculptures by Giotto, Brunelleschi, and Ghirlandaio that decorate the chapels while a guide explains their meaning and importance. For a sensory treat that combines the feel of a medieval apothecary with the fragrance of luxury Italian perfume, browse elixirs and bath products in the little-known pharmacy tucked within the church walls.